K-Swan is a social worker in Huntsville, Alabama. After completing her graduate studies, K-Swan decided that she wanted to give back to her community by way of a non-profit organization. 1st Lady Empowerment Foundation, Inc. was birthed out of a passion to help young girls build their self-esteem and self- worth in 2008 and focuses on the empowerment of young girls who deal with self-esteem. For many years K-Swan struggled with loving herself. It was hard for her to love what she saw in the mirror as a child and into adulthood. K-Swan finally decided enough is enough and worked on herself from the inside first. For 11 years, K-Swan spent her time as manager at an elderly housing facility. After seeing first hand the effects of not living your best life, K-Swan decided to include empowerment efforts for adult women. After 14 years at that job, K-Swan was unexpectedly released from her duties and suddenly found herself in a ‘what am I suppose to do now’ moment. Prior to this in 2013, K-Swan became a certified life coach. K-Swan felt something was missing as she conducted workshops and mentored young girls on how to love themselves and follow their dreams. She knew she was not heeding to her own words. At this realization, she fearfully and courageously enrolled in acting classes. K-Swan currently lends her time as a behavioral specialist for a company who provides services to families and children in the foster care system. After feeling an enormous amount of sadness for these children when leaving a visit with their moms and/or dads, K-Swan tried to make the car ride fun to take their minds off their pain. As a result, ‘Kar-Rides w/ K-Swan’ was created to reinforce positive affirmations in the children. K-Swan realizes that they may not understand what they are saying now, but she believes that they will remember and believe in themselves despite their circumstances when they get older. When she isn’t mentoring foster children and adolescent girls in the community, she spends time filming short films, television shows, filming commercials and recording a podcast/talk show. She created and launched Dreamers Preparatory for Girls ages 8-17, in October 2017. 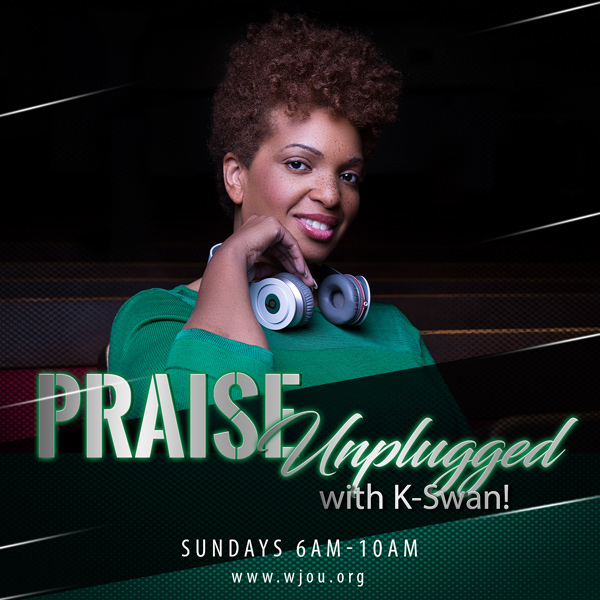 K-Swan joins the WJOU family with excitement and is eager to share the gospel of Jesus, and inspiration with the world. So let’s get our praise on!